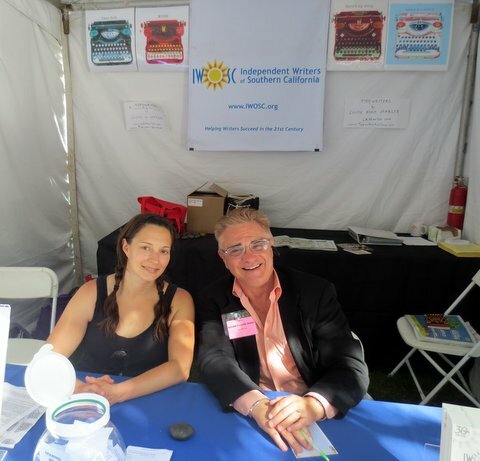 Spent a temperate, sunny day on Saturday working for Independent Writers of Southern California (IWOSC) at the Los Angeles Times Festival of Books. Shown here person-ing the booth with Monika Vogl. Also on my shifts were Layne Wong, author of Shanghai Love, Susan E. Briggs, author of I Can See Heaven, and IWOSC's irrepressible president, the super-publicist Flo Selfman. Thanks particularly for your smiles and wise words to Louise Marler, Norm Ellstran, Robin Quinn, Ester Shifren, Pam Leven, Ruth Frechman, Lee Gale Gruen, and LA Opera's Shannita Williams. We talked about the male-centered comic genre boychik lit. And it's not the first time I've thought there could be more female fans than men. It probably has something to do delighting in Rollo's cluelessness as he fails continually upward, inheriting more undeserved trouble at each new level.